Whitetail deer can be found in much of the United States and also in the southern parts of Canada; however, they also are found in Central America as well. Just as any other animal, they go through certain life changes and life cycles throughout different seasons. Learning about whitetail deer information can be enlightening and helpful. While many people focus on the life of the buck, here we want to focus on the whitetail doe and her life during the spring. During the spring, the whitetail deer doe has a very different coat than during the fall and winter months. She loses the thick, grayish coat that she usually has in winter and fall, and the coats becomes a shorter coat that is a reddish tan color, and the hair is thin and wiry as well. This change of the coat occurs to provide the whitetail doe with a cooler coat that is more appropriate for the warm days of spring, and of course the subsequent summer as well. 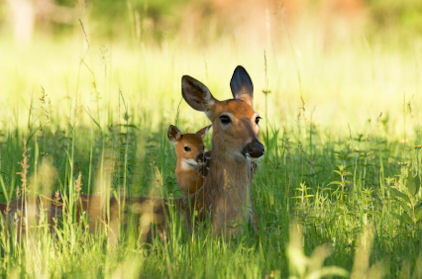 Since mating season occurs in the fall, springtime is when whitetail doe tend to have their young. The average gestation period of the whitetail deer doe in North America is 200 to 205 days. This period can be shorter or longer depending on the availability of food. 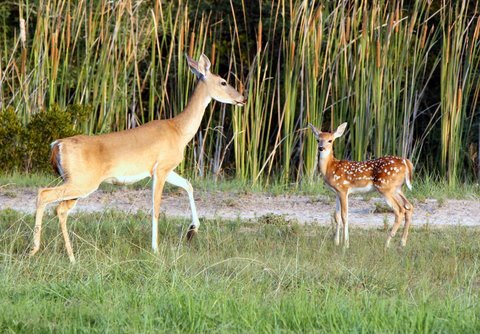 When food is plentiful the fawn will be born after a shorter gestation time while the opposite would be true if the food supply is scarce. As a general rule, most doe end up only having one fawn the first time; however, the following years they are more likely to have twins, and it's really not uncommon for them to have triplets in some cases as well. Once she has her young, she is on her own raising her young. Usually when the doe has her young, she gives birth quite easily, either lying down or standing up. Often they even return to the very same place every spring in order to give birth to their young. They spend their time nursing their fawns about 2-3 times every day for the first few weeks. During that time often the deer whitetail doe will go out to feed herself, returning to her young after a few hours. Once her fawns get to be about a month old, they begin going along with her when she goes out to find food. Of course during the spring while her fawns are still quite young, whitetail females are quite protective of the young fawns. When she does go out for food on her own, she usually will leave her young in a safe hiding place. Even after she begins taking out the fawns with her looking for food, they are usually not totally weaned until they are about 8-10 weeks old, meaning that she is quite tied down to them for some time. Another interesting fact about whitetail deer doe in the spring is that this is the time when she often kicks out young males who were born the year before. Usually young bucks stay with their mother until they are almost a year old, but during the spring they usually leave on their own or the females will drive them away. On the other hand, young females often will stay with their mother for up to two years, and even then they usually stay in the same general area as their mother. However, once it is time for the doe to have a new litter of fawns, she often will return to her preferred fawning area in the spring, excluding the rest of her previous fawns from the area. So, for the female whitetail deer, the spring is a very busy season, filled with late pregnancy, giving birth, and then starting to raise her new fawns. During this time you may see does and their fawns out together, and is more rare to see groups of doe together, since they are busy caring for their young.